I picked up two dendobium orchids from Indam and I have started to fall in love with them. 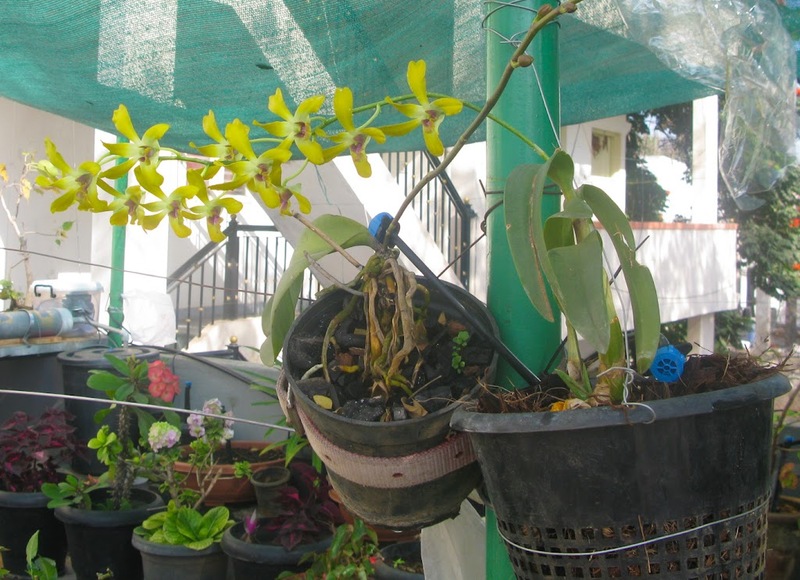 Do any of you know, if they are any courses in bangalore that I can attend, to know more about "how to grow orchids and how to propagate them". I am regular visitor to Lalbaug Flower Shows. And I am in love with the orchids. I am scared for their price though. I purchased a small dendrobium for Rs. 50 in August and still just watching it as it's fairly standstill right now. I have found a lot of information on the web though. google for a dendrobium or Orchid care etc. and there's lot of info there. There are some very good books available as well. They may be pricey, too; but are good for reference. My plant right now has shed all leaves and hasn't flowered yet. So I cannot call myself an expert on the topic. One tip I have read is that you should water them every 5 to 12 days. I water my plant twice a week though. They also say, "feed it weekly, weakly". Liquid fertilizers are probably the best to mix in water and feed an orchid. typically, feed should be at half or quareter strength of what you would give to other plants. Apart from all this, just leave the plant for it to adjust to the evirons and conditions. They are extremely low maintenance plants. So if you have a fullgrown one with flowers, all you have to do is just keep a watch. even suggested that they require a rest period from November to Feb and they shouldn't be watered at all during this period. Anyways someone helped identify the orchids as phalaenopis type dendrobiums on orchidboard.com and I'm gonna mix your suggestions with hers. I agree net resources can confuse you. I would hesitate to follow the outlier instructions though. So I would not keep my plant in drought for 3 months anyways. Mine is a very small plant, just two stems right now that are about 4 inches or 5 inches tall. No leaves, no flowers. From the canes, I could figure out it's a dendrobium. I am confused whether my plant is "resting", "acclimatising" or "growing". And hence I am watering regularly. At times once a week but most often twice a week. Since it's a small plant and wasn't potted (just tied between two coconut shell clams), I got it cheap. Since it was my first orchid, I chose this one to gain experience. By now, though, I know buying mature ones in flower is a better bet even at a higher cost. So what you have done is a good thing to do anyways. Feed your orchid once or twice a month at very weak strength. Orchids respond slowly. So you will need to be patient probably. (My plant has not moved an inch for 3 months now). I am gauging it's health by looking at its roots and their development. Looks OK to me so far, despite initial sad shedding of leaves. Wish you the best. Do share what you learn from yur experience. I will be keen to hear. I love orchids and have 3-4 varieties. I have them in small pots with holes in the sides and I have put in lots of charcoal, tree barks and am now trying out something new - a 1:1 mixture of vermicompost and cocopeat mixed well - this should hold the water for some time during the hot seasons. Do you think this is a good way? MG - Also, what do you mean by "Feed your orchid twice a month"? that is, with what ? NPK or something very specific for orchids that you can buy from shops? I tried not to water or feed my orchid during winter here in Bangalore. And my orchid, in fact, has worsened a little. Now it's been a week since I started watering again. And realized that it will probably like water every alternate day if not everyday in the weather we have for now. I have fed my orchid only once in Sep. 2010. Yet to feed it after I restarted watering. In general, from my reading on the net, anything you normally use for the other plants would work for an orchid. Use half or quarter strength than normal plants though. As of now, my plant hasn't grown any which way (declined a bit during a month and half of "rest" when I did not water (Mid Dec. 2010 to Jan. 2011 end.). Still watching it carefully. My plant is blessed with showers of dead leaves and petals of old flowers automatically in the place I have kept it. And hopefully, those will feed my orchid slowly. I work with organic feeds and nothing chemical. So natural addition to the mix is something I am watching whether it works. Still no real progress . So will update once some signs of victory. Dealing with loads of patience. Forgot to give my thoughts on the potting mix. I am using coco shell chips and charcoal with some brick bats. Not sure on a finer mix like cocopeat or such. Orchids love drainage. Roots also need some air movement around them. A coarse mix of the type you're using should work much better than cocopeat (exception terrestrial orchids that grow in earth). If you think the mix is losing water quicker than you would like, water it more often. Dry period between two waterings isn't bad for orchids. Orchids need humidity. Its very essential for growth of the plant. My mom has lots of orchids at my parent's house(She even has Orchids growing on a coconut tree) in Kerala but the humidity there is quite high.You can artificially increase the humidity by keeping the orchid pot in a tray of water or keeping wide-mouthed-shallow containers filled with water near the orchid pots when it is hot outside. 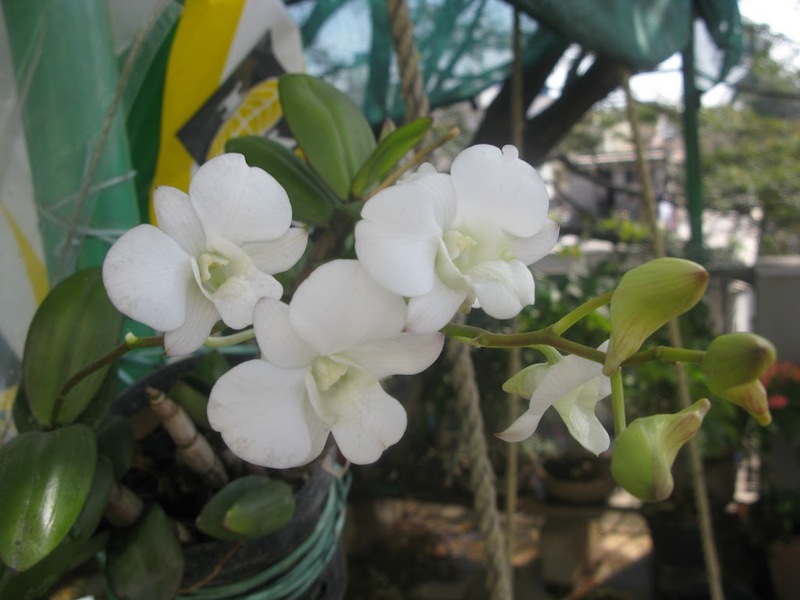 You can buy Orchid Grow water soluble fertilizer and use it twice a month. My mom uses something called kadala pinnakku(Malayalam) not sure what it is called in English. They are like flat round cakes given as cattle feed. She soaks this in water for a day and then uses the water for the orchids. Thanks for sharing this info Jamie. My plant, I guess is coming out of it's sleep mode. I have read on the net that dendrobiums need rest from August to Spring. Since, in Bangalore, Spring arrives around Feb, I have restarted watering. In view of the dry weather, I have started spraying some water around the plant and the pot. Additionally, the plant pot is hanging on a pot stand where the plate below one of my roses is full of excess water drained from its pot. And all other plants there form a nice corner, so hopefully, my orchid is going to like all this. Just waiting for it show first visible signs of growth. Roots look healthy but they are still small an inch or two long. So waiting for this sleeping beauty to wake up. I love such surprises and don't mind a few tantrums from my plants. Your guidelines will certainly help. I have purchased a water soluble fertilizer; but since my plant was not being fed for close to 2 months, I haven't used it yet. Will do it as soon as I see some growth and need. Also they need shade. Do not keep the orchids in direct sunlight. Spraying water on the leaves will burn them if kept under direct sun. Keep a small container filled with water near your orchid plant. thats a lot of tips.. I have a few of the Vanda family and Dendrobiums. both seem to be hibernating. I usually keep all of them in a shady place, spray them with water once a week on the leaves and soil. the Vandas are fine, but the Dendrobiums dont look very healthy. Got some sprayable fertilizer this weekend (NPK and something similar). Also planning to build a small (10x15 feet) green house. Found that building a green house with steel+plastic is costing a lot (got quotes of rs. 40-60,000). Then decided to build one myself with a combination of Banboo sticks (for support all around) and shadenet. Does anyone have an idea about this or any better way of doing this up? Thanks Jamie, right now, the direction of the sun is such that my orchid gets only indirect light. I will move it if I feel it's coming into direct sun during summer. Glad to hear back from you. Vandas.... very nice. I hear they are the difficult to grow kind. Also terrestrial, if I'm not mistaken. They come certainly in very exotic kind of blooms. I did learn from the net that dendrobiums emerge out of hybernation rather miserable. So don't feel bad. Look out for any swelling in the stems near the hub. If they are somewhat swelled, start watering now. Depending on where you are in India, spring may be just approacjing now that it's Feb. You can start feeding them. Do refer to an older blog from GG where he has described his greenhouse construction. Some of your Qs are definitely answered by GG. If you have some more questions, he and others on this site are certainly helpful. You can open a query separately for this topic, if you find it necessary. Do take a look at lots of archived blogs, posts and also the forums opened in hydroponics or elsewhere. of my orchids just bloomed two weeks ago and the flowers are still on it. The white dendrobium has produced two new flower spikes. Sounds like Orchid Season to me! Yay! The yellow dendrobium lost two new shoots, really worried now. I should take this off the drip system as I guess its getting too much of the nutrients. This looks soooooo lovely. I am so glad that I came across this forum. 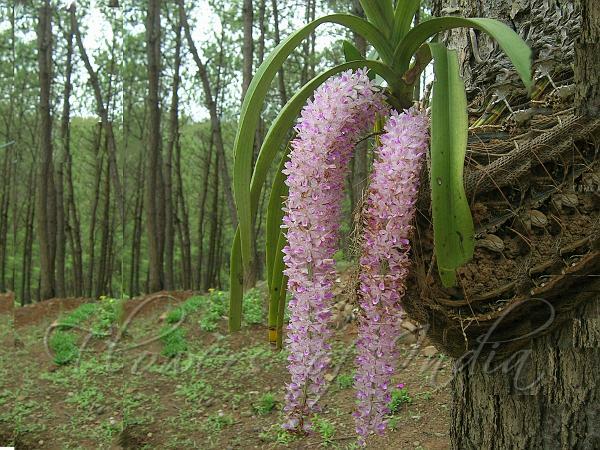 Where can I buy orchids in Bangalore?? Recently I acquired an orchid when I went for a trip to north-east. Its so abundant there, that I just pulled it out a tree on the road and people around were wondering if I have gone crazy!! I cannot wait till my next trip to get another orchid. I have a similar one but in creamy yellow for sale. Soon there will be a sale of orchid seedlings. Interested can let me know. wud like to take the seeds of orchids from u,plz let me know if its possible to courier to Delhi. if not then I can ask someone from bangalore to pik it for me. There could be multiple things that is causing the problems you are facing. a. Lack of sunlight. I know they can be grown indoor but there should be some bright sunlight for them to grow. Is there a too strong compost in the mix? You need not pluck the plant to check root. Just dig an inch near the crown of the plant and feel the stem. If it is woody, then it ok. if it is rotten, it will be very slimy. The ones I will be geting are all seedlings. Orchid seeds are raised in tissue culture laboratory. I can give the seedlings if you have anyone picking it up from me. "I have a similar one but in creamy yellow for sale. Soon there will be a sale of orchid seedlings. Interested can let me know." What is usual time frame for orchids to bloom from seeds? I am interested in orchid sale, particularly fox tail orchids. Please let us know when the sale is on.